Durham launched a belated fightback on day two against Sussex at Hove, but rain limited play to just 17.4 overs. After conceding 441 runs on the opening day, they finally broke Luke Wright's sixth-wicket stand with Ben Brown when Wright was caught behind for 189. Chris Rushworth was the successful bowler and two balls later saw off Ashar Zaidi went in similar fashion. Brown was bowled by Mark Wood for a career-best 163, but Sussex were 505-9 when the weather forced a halt to play. Rushworth's double success gave him figures of 4-124, while Wood also removed James Anyon for 23 with the help of Kumar Sangakkara's third-slip catch as he posted 3-117. Steve Magoffin (15) and Jon Lewis (8) were the not out batsmen at the close, with their side in a strong position to try and force a victory if the weather holds over the final two days. Durham, despite picking up a second bowling point, have now conceded 500-plus runs in a first innings for the second game in a row. "The 17.4 over we did alright, we got four wickets and broke that partnership that seemed to be endless yesterday." "The rain has come in and hit the ground pretty hard which has taken a lot of time out of the game but the situation we're in it's probably not the end of the world. "There are a couple of areas not far off the square that have taken a beating from the rain, so play was never really likely even with the sun and a drying wind." "Durham fought back after a chastening first day, taking four wickets for 64 runs, even through their main striker bowler, Graham Onions, is suffering from a sore back. "Conditions were very much more in favour of the bowlers, but with the players taken off for the light two balls before lunch, the heavens well and truly opened five minutes later and no further play was possible. "Sussex have got themselves into a commanding position and are likely now to declare to give themselves a chance of trying to bowl Durham out twice - the follow-on target being 356. "It is a good batting wicket, but the overhead conditions are what the Durham batsmen will be looking at when we resume on the third morning." 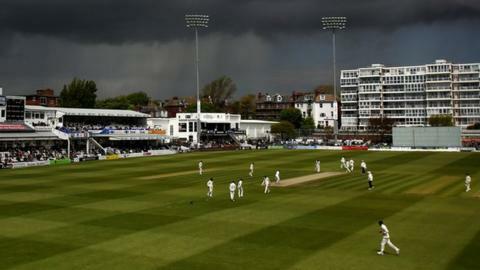 For the second Championship match running the weather is threatening to stop Sussex from pressing home their advantage from a dominant position. At Old Trafford last week a near total washout on the final day prevented a potential victory over Lancashire, and with just 17.4 overs possible today and an inclement forecast tomorrow, time may now be against Sussex in this match. For the record the magnificent sixth-wicket partnership between Ben Brown and Luke Wright was eventually worth 335, and Sussex will hope that the weather relents and those efforts are not in vain.